Here is a link to the Harmony breakout sessions. To kick off Harmony, we are encouraging people to do lightning talks, which are intended to last no more than 5 minutes. The topic can range from a software tool you are producing with COMBINE standards (e.g. SBML, SED-ML, etc.) to difficulties you are encountering with standards. This is an opportunity to find out what people are doing with COMBINE standards. If you would like to sign up, please go ahead and edit the document directly. During the meeting we were also using this document to edit the agenda as needed. We are planning to have fun activities in Friday afternoon! Please sign up on this page. HARMONY 2017 takes place at the University of Washington (UW, and commonly called "U-Dub") in Seattle, Washington. HARMONY 2017 will take place in the William H. Foege Bioengineering building. Please check the floor plans below. 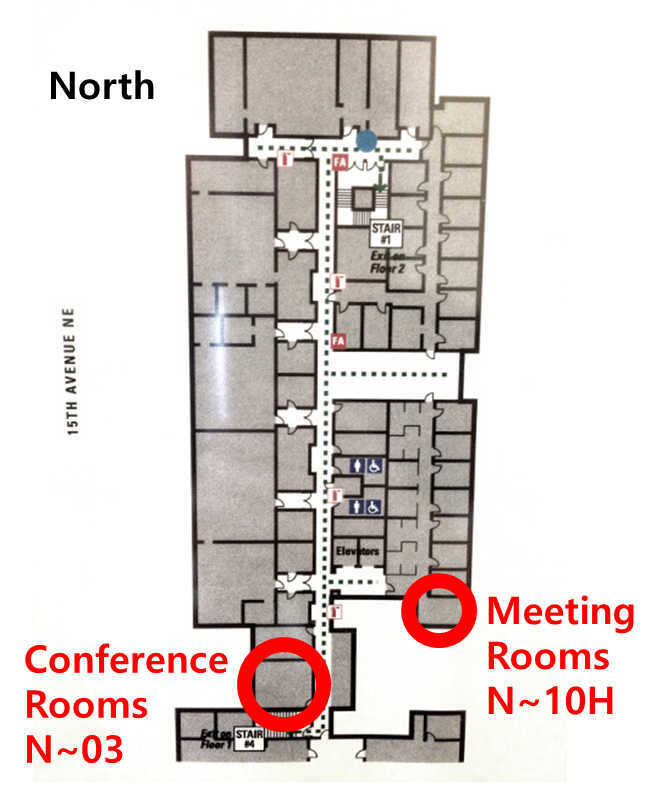 Conference rooms (N~03) and small meeting rooms (N~10H) are located at the same location each floor. On Monday, we will start at the T-wing of Magnuson Health Sciences Center. Please check the agenda above and the map below. Navigating through Magnuson Health Sciences Center can be challenging. To get to T-739, use the stairs/elevators marked with circle below to get up to 7th floor. There are various ways to enter the building, but entering T-wing directly through the overpass or through the west-side entrance might be the easiest way to get inside. Registration is now open! Register through Eventbrite. Financial aid is available for students while funds permit. Please fill out this application to be considered. Please DO NOT register until after your application is approved. We will send you a confirmation code to allow you to register for free. Email any questions to Kyle Medley, medjk (at) comcast.net. If financial aid is not possible, students enrolled at a university are still eligible for a special discount rate. Late registration carries a fee of $50 starting May 12th. We have reserved a block of rooms at University Inn from Sunday, June 25th to Friday, June 30th. The hotel is located at about 10 min walk from the venue. We have extended the deadline! Please book by Friday, June 2nd to guarantee special pricing. The deadline for reservation has passed. Please inquire the hotel about the room availability. Please see the travel page for detailed information. Travel scholarships are available while funds permit. Please fill out this application if you wish to be considered. Below is a map marked with several points of interest. 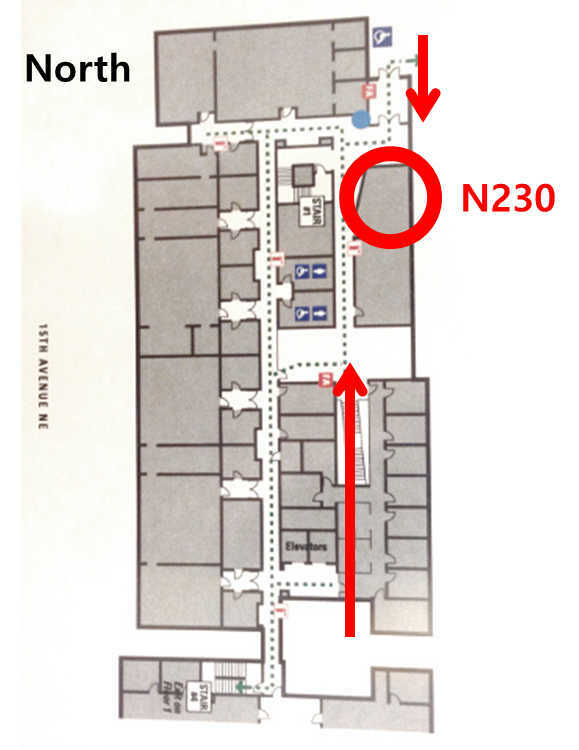 The easiest way to get to Foege Hall from the hotel is to go east on NE 42nd St and to south on 15th Ave NE until you see an orange building (Foege Hall). It takes about 15 min walking, but if you would prefer to take a bus, there is a bust stop right across the street from University Inn where you can take route 67 which will stop by Magnuson Health Sciences Center. However, to go back from Foege Hall, you have to take the same bus on a stop located on W Stevens Way NE. There are also many different ways to get food around the campus (green markers). University Way, in particular, offers various options to eat.